Really different, right? At first, I was a bit taken aback. I had really grown to like the first cover. I could see that it had a lot of really great elements, like how the bright colors against the black was a really bold statement, and the the bomb really conveyed the "hazardous" part of the title. Also, this is a book I could envision guys picking up as well without a second thought. The new cover, however, has lost all guy appeal, in my opinion. The kissing couple and the curvy font will appeal to more girls though. However, the couple (I love how the notebook covers up the heads. It looks like something that belongs in a photoshoot for a Susane Colasanti cover! ), definitely holds more "teen appeal". 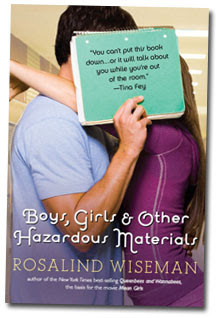 But I have to ask...where's the "hazardous" coming through with this cover? Both are good covers, and it's hard for me to pick one over the other. I'm just happy that my ARC has the original explosive cover. Now I am really tempted to move this book to the top of my TBR pile! I have to say I like the original better. It was more unique and seemed more fun, but I can see why the publisher changed it. I definitely like the first cover better. I don't think I'd be picking up the second cover if I came across it. It just seems SO girly, and I'd end up judging the book by its cover a bit too negatively. The first one has the pop that the name calls for like you said- hazardous isn't really conveyed in the second one. And the second cover lost all appeal to guys. But I like the second cover better. I like the first one better. Sets it apart from other books with the kind of cover on the 2nd one - which I see a lot of. I definitely like the first one better. So many teen book covers are photographs of people so they all tend to look the same. Nothing stands out anymore when all book covers are photos of people. 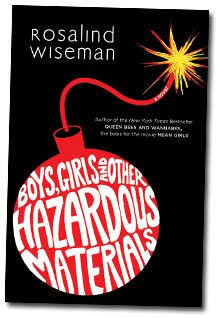 The first cover stands out and, as you mentioned, appeals to both boys and girls. I think they definitely alienated the boys with the new cover. My preference is also for the first cover- for the same reasons as Melanie and Beth. I'd have to say I agree with Melanie...I don't really like the girly covers. Oh the first one is definitely more appealing. The second actually looks like something you would throw on an ARC until the real cover is ready. Very generic. The second definitely looks more like chic lit. I think a guy would be cautious to pick it up if he's got a macho image. I also agree with Donna that the first version is more unique. I'm getting this book in the mail soon from another blogger and I can't wait! I like the new cover though.